Photo: Take a walk and explore. Raksawarin Hot Springs is probably the most popular attraction in the immediate vicinity of Ranong town, attracting both Thai and foreign visitors who can dip their feet into public pools, splash out for a luxury dip or simply relax beside the clear Phoemphon River. The springs have arguably been overdeveloped, with lots of concrete terraces, car parks and private businesses charging admission fees to use gated-off pools or roofed soak houses. For free you can dip your feet into shallow public pools with water at a soothing 40 degrees Celsius, and check out a steaming natural well that’s featured in all of the tourism brochures. Keep your hands out of that one; the water inside is hot enough to boil an egg. Charging 40 baht per person, Tinidee pumps the hot water into slightly larger pools and the price includes use of towels, lockers and showers. Across the road between eateries and souvenir shops, Siam Hot Spa (T: 077 813 5513 ; siamhotsparanong.com) charges 600 baht for private roofed Jacuzzi tubs and also offers spa treatments and massages. The scenic natural area surrounding the springs is another reason to visit. Suspension footbridges span the river and locals like to lounge with their feet in the clear water, perhaps with a plate of som tam and grilled chicken purchased from one of the vendors. Jungle-clad hills rise on either side and steep steps lead up to a Buddha image off the southern bank. If you get hungry, Kun Lin Restaurant serves local specialties across the street and several vendors churn out cheaper meals. You’ll also find rooms for rent near the hot springs at Baan Bunga, Happiness Lodge, Rattana’s Resort and Andaman Talaythai Boutique Hotel. The latter is probably the best but none knocked our socks off, as mustiness is a problem in this notably damp area. From here you can continue east for 10 kilometres to Ranong Canyon. Hot spring enthusiasts should also check out the quieter Pon Rang Hot Springs, which is part of Ngao Waterfall National Park and located five kilometres south of town off Route 4. 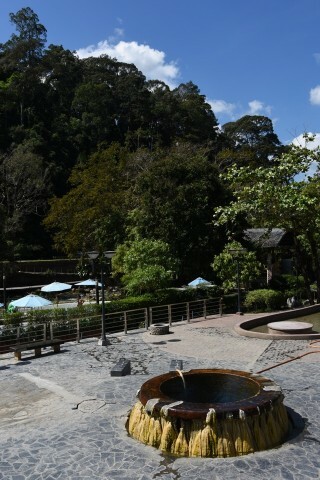 Raksawarin Hot Springs is located just east of Route 4 and open daily 07:00-21:00. Maroon songthaews marked in English depart frequently from Municipal Market on Rueangrat for 20 baht per person. If coming on your own, take Kamlangsap east from Rueangrat and bear right near the hospital onto a narrow bridge running beneath Route 4. Once on the other side, it’s a straight 500 metre cruise to the springs.